I recently started getting some eggs, meat and produce as part of a “buying group” of local Charlotte mommies. About every two weeks we submit a bulk order and gather at our friend’s home to divvy up the spoils. The experience has been excellent! It feels great to support local farmers and I feel like I am challenged to use ingredients I might not normally cook with. For my last order, I decided to try yellow sticky rice from Clyde Valley Farm in Morganton, NC. 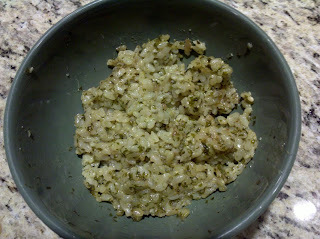 The following recipe was my first, yet incredibly delicious, foray into the world of sticky rice! Yum! Although I used sticky rice, I wouldn’t hesitate to try the following recipe with regular white rice. Saute onion and jalapeno in the olive oil for a few minutes until they are tender. Add the parsley, cilantro and garlic. Saute for an additional couple of minutes. Add in salt and cumin. Stir well. Transfer these ingredients to a food processor. Add about 1/3 cup of chicken broth or stock and puree. Set aside. In saucepan, heat another tablespoon olive oil. Add the sticky rice. Coat well with oil. Cook for a few minutes – stirring constantly over medium heat. Add back in the pureed herbs and about 1 2/3 cups of chicken stock or broth. Heat to boiling – reducing the liquid a bit. Reduce heat to low. Cover and cook for about 20 minutes. Uncover and let stand for a few minutes. Stir well and serve. Unfortunately, I only made 1 1/4 cups of rice – next time I will probably double the recipe – or at least go to 2 cups. There was absolutely nothing left of this! Delicious! Oh yum! Presently I am living in the Philippines and they use sticky rice all the time. Really it is called Japanese rice. They use sticky rice here for making sushi—-try it; it is very easy to make—need sticky rice, nori (seaweed), then mango, or cucumbers, or imitation crab, or anything to fill each roll. In Japanses/oriental stores look for the ‘rolling mat’–very easy to make–impress your family and friends. Sounds like a great idea! Thanks for the comment!